Simon: This piece carries the logo for the Order of the Eastern Star. Can someone help explain a little about the Order of the Eastern Star? As a Male member of this Order (Past Patron) here is an explanation of the Order; The Order of the Eastern Star is a fraternal organization that both men and women can join. It was established in 1850 by Rob Morris, a lawyer and educator from Boston, Massachusetts, who had been an official with the Freemasons. It is based on teachings from the Bible, but is open to people of all theistic beliefs. It has approximately 10,000 chapters in twenty countries and approximately 500,000 members under its General Grand Chapter. Members of the Order are aged 18 and older; men must be Master Masons and women must have specific relationships with Masons. 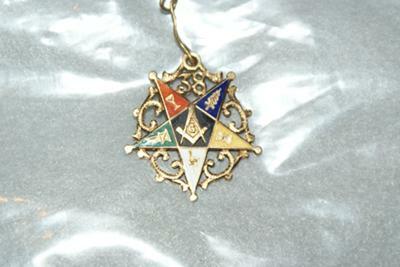 Originally, a woman would have to be the daughter, widow, wife, sister, or mother of a master Mason, but the Order now allows other relatives as well as allowing Job's Daughters, Rainbow Girls, Members of the Organization of Triangle (NY only) and members of the Constellation of Junior Stars (NY only) to become members when they become of age. Hope this answered your question, Simon. Thank you for sharing this with everyone, Past Patron Bowman! 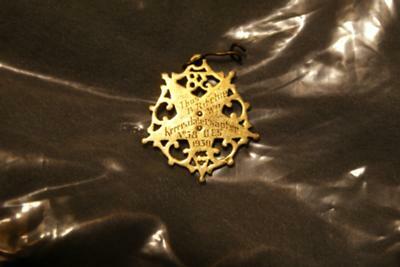 This is the badge of the Past Patron of the Order of the Eastern Star.